I was afraid I wasn't going to have anything to blog about chapter 4. Nothing stirred my soul when I read it. The story felt complete, but I didn't find anything new and noteworthy. Then our group met. I learned so much. I was inspired. I was stretched. I changed. This is what I love about studying the Bible with other women. It changes you. You can't say that about a book club--and I enjoy book clubs. You can have a great time with friends discussing the same book. You can change your opinions, but you don't walk away, week after week, a better person because of the time you spent with a group of women. When you study the Bible together, you grow a bond of trust and understanding. You become vulnerable. You are willing to say, "I don't understand" and you are willing to be taught. It's simply beautiful. I have a bit of prejudice against this kinsman redeemer who is first in line for Ruth. Ruth sounds like an amazing catch to me--who wouldn't want her in his life? But this man didn't. I don't get it. When the man turns Ruth down because he might endanger his own estate, I could only explain it by deciding that he must be married. But that doesn't make sense either and there really is no indication of this. So I approached our group and said I just didn't understand. Then one of the girls who is Colombian commented that in her culture, things were different. Family stuck with family. Family trumped marriage. I lived in Colombia. I could see what she was talking about. The family ties were stronger. Then another woman spoke up. Her in laws are Chinese, living in China. She said that the family loyalty was stronger than even marriage. I began to think about what I have encountered here in Taiwan. From the women in my first Bible study to the women at work, I have picked up on this order to life where the in laws dictate your life. Care of parents is paramount. My friends hate holidays because they do all the work. I mean all the cooking, all the cleaning, all the hosting. It is the daughter-in-laws job to be the servant of all. This is mind baffling to me and something that I can't quiet grasp, even though I watch it going on around me. In this kinsman redeemers mind were the strong bonds of loyalty to his family. If he died and only had one child by Ruth, he did not want all of his earthly possessions to go to Naomi's family as the redeemer price. All this man could see were the things. The tangible elements that are passed from generation to generation. Boaz had a different perspective. Boaz looked at the person, not the possessions. Boaz was willing to risk things to help a woman. Boaz may have had more at risk than kinsman redeemer number one, but because he put his focus on people and not things, God blessed him. 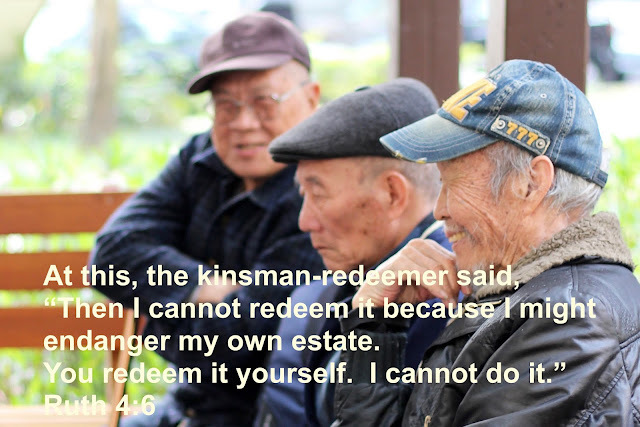 Kinsman redeemer gave up so much by not taking Ruth as his bride. We don't even know his name, just the fact that he turned down the opportunity to be in the line of the Messiah. What blessings are things stopping you from? It's easy to loose our focus on those around us and to only care about things. But as soon as we do that, we are missing on so much more.